ThermHIT 25 weed burner on gas 25 cm. 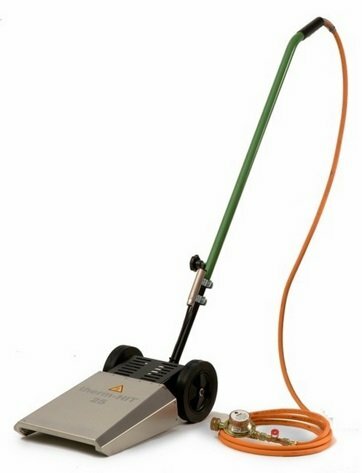 HOAF ThermHIT 25 weed burner on gas 25 cm. HOAF ThermHit 25 gas infrared weed burner. Especially for the demanding user. Work precisely, easily and effectively. With this HOAF ThermHIT 25 the weeds can be controlled very easily. The working width is 25 cm. This weed burner can be operated with just one hand. Due to the mounted wheels, it is easy to work without heavy load. The handle can be adjusted in height, which makes it even more ergonomic. The HOAF ThermHIT is easily operated by means of the (Piezo) electromechanical ignition. The heat output is neatly maintained under the protective cover. This allows safe and precise work. The power is infinitely adjustable with the ten-step pressure regulator. The ability to adjust to the amount of weeds. An area of â€‹â€‹625 square meters is treated at a walking speed of 2.5 km / hour. Lifting a weed burner is a thing of the past. Only the pushing of the burner is sufficient. PAY ATTENTION! We only sell and deliver this machine in the Netherlands. - Working width: 25 cm. The weed burning principle of the HOAF ThermHIT 25 is based on the HOAF Infraplus System. This involves using infrared radiant heat in combination with warm air. By exposing the unwanted vegetation to this, the proteins clot and burst the moisture cells of the weeds causing the plant to wilt. 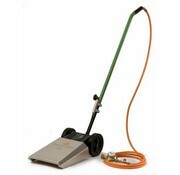 Create your own review for ThermHIT 25 weed burner on gas 25 cm.